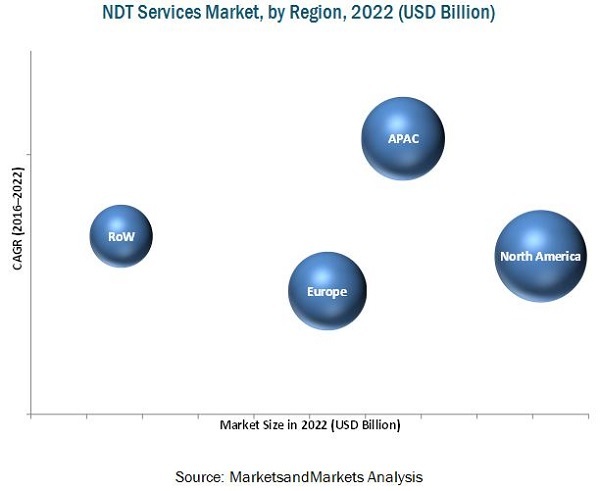 The NDT services market size was valued at USD 4.77 Billion in 2015 and is expected to increase to USD 8.55 Billion by 2022, at a CAGR of 8.52% between 2016 and 2022. This report provides a detailed analysis of the NDT services market based on technique, type, vertical, and geography. The availability of different NDT methods according to the industry requirements to ensure quality inspection is leading to the demand for the market around the globe. This report provides valuable insights regarding ecosystem of this market such as NDT equipment manufacturers and suppliers, NDT training and certification providers, system integrators, middleware and firmware providers, suppliers and distributors among others. Companies such as Mistras Group Inc. (U.S.), GE (U.S.), Olympus Corporation (Japan), Nikon Metrology (U.S.), and others provide NDT equipment in the NDT services market. The NDT training and certification has been provided by some players such as TUV Rheinland (Germany), Intertek (U.K.) and TEAM industrial services (U.S.) among others. The NDT service providers include GE Oil & Gas Digital Solutions (U.S.), Ashtead Technology (U.K.), Zetec Inc. (U.S.), and Yxlon international GMBH (Germany) among others. The end users of NDT services include PSEG Nuclear (U.S.), BP PLC (U.K.), and Southern Company (U.S.) among others. Detailed analysis and profiling of additional market players (up to five) and competitive landscape. The NDT inspection services market is expected to hold the largest share between 2016 and 2022. NDT inspection is used to validate the integrity of materials, detect instabilities, discover performance, and recognize failed components. As a result, it is of utmost importance so as to evaluate the reliability of the product and prevent catastrophic failures. The training market is expected to grow at the highest CAGR during the forecast period owing to the shift towards advanced NDT techniques such as phased array ultrasonic testing (PAUT) from traditional NDT techniques which requires skilled technicians for inspection. In the NDT services market, the ultrasonic testing technique is expected to occupy the leading market share during the forecast period. The ultrasonic testing is fast, reliable, and versatile method of inspection which can detect internal and hidden discontinuities. The terahertz imaging market is expected to grow at the highest CAGR during the forecast period. A wide range of imaging and spectroscopic capabilities possessed by terahertz technology makes it suitable for the investigation of material integrity and thus it is being used widely in paints and coatings defect identification, electronic circuit inspection, and food quality inspection among others. Among the verticals, the oil & gas sector is expected to occupy the largest market share during the forecast period between 2016 and 2022. The demand for NDT technologies in this sector is largely driven by government regulations for improving the safety of people and environment by avoiding oil spillage due to leaks, bursting of pipes, or any other accidents. The manufacturing sector is expected to grow at the highest rate due to various government initiatives such as ‘Make in India’ by Government of India, “Industry 4.0” in Europe, and “National infrastructure plan” in South Africa among others. North America held the largest share of the NDT services market in 2015, and it is expected to grow at a moderate CAGR between 2016 and 2022. The market in this region is driven by dominant construction and manufacturing activities in the region. The market in APAC is estimated to grow at the highest rate for this market during the forecast period. The demand for non-destructive testing in the APAC region is expected to be driven by advancement in terms of economic growth, infrastructural developments, and construction of power plants. The major restraint for this market is the fluctuation in the prices of oil and gas. This has increased the price pressure in the capex inspection activities done by the companies. Also, it has led to a delay in the maintenance of refineries by the companies. Therefore, the NDT services have been affected temporarily to some extent due to this. The key players in the NDT services market include GE Oil & Gas Digital Solutions (U.S.), Ashtead Technology (U.K.), Mistras Group Inc. (U.S.), Zetec Inc. (U.S.), Intertek Group (U.K.), Yxlon international GMBH (Germany), and TUV Rheinland AG (Germany) among others. GE Oil & Gas Digital Solutions (U.S.) majorly focuses on organic growth strategies such as new product launches and expansions. It has made technological breakthroughs in the NDT inspection.